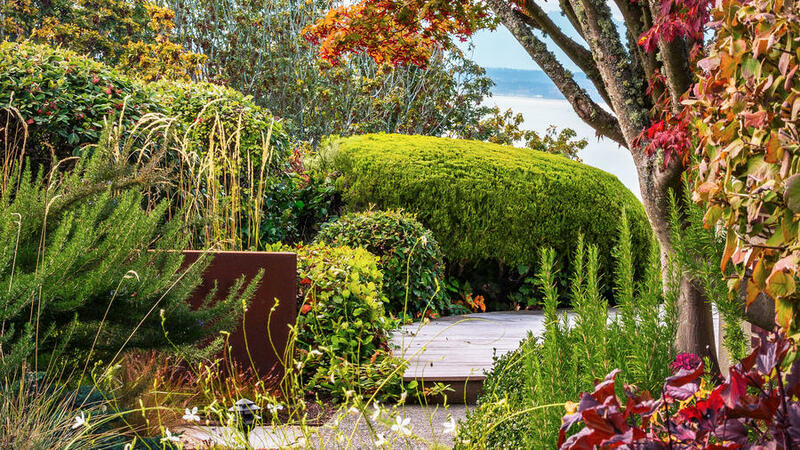 When she took on this West Seattle backyard, wanted to create a garden that would shine year-round. But she admits to playing seasonal favorites: “I really love this garden in fall because it gets kind of unruly,” says Port. That’s when the ripe grasses turn golden and the dogwoods’ leaves blaze scarlet, the late afternoon sun intensifying the quintessentially autumnal palette. With a mix of low groundcovers, mid-size perennials, and well-­established trees, the backyard was designed to lead the eye along peaks and valleys of vegetation. Combining traditionally pruned hedges with more wild, mind-of-their-own grasses and fall-blooming gaura adds points of interest without disrupting the natural flow of the landscape. The path provides tantalizing glimpses of Puget Sound before the garden opens up to a view of the water and the Olympic Mountains. Sleek and modern without being distracting, the Corten steel wall acts as a break in the garden and leads the way toward the house. The rusted façade works in all seasons, but can’t be beat when bathed in the light of a low-lying sun while ­surrounded by golden blooming grasses and fall’s changing leaves. The pink flower clusters of ‘Morning Light’ Japanese silver grass and the straw-gold plumes of ‘Karl Foerster’ feather reed grass add movement and color. After they’re cut down in winter, attention shifts to the evergreen mugo pine, red-stemmed ­Sedum ‘Matrona’, and rosemary. All parts of the garden are watered with drip irrigation.